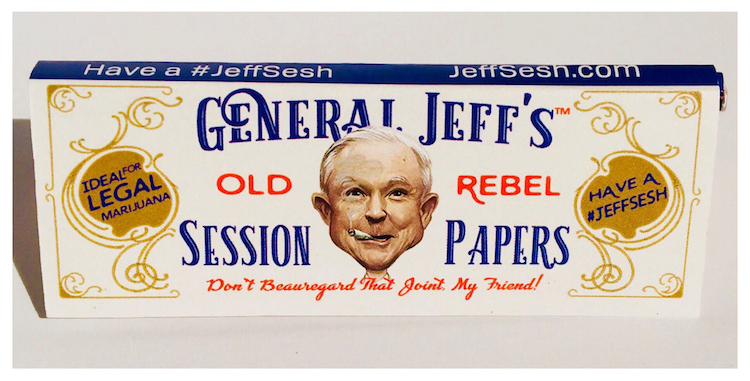 An anonymous group of cannabis activists flying under the banner “#JeffSesh” is selling rolling papers with the face of attorney general Jeff Sessions on the front of the pack smoking a joint. Sessions is infamous for his regressive and draconian stance on cannabis and the drug war. He has created waves of controversy by saying that “good people do not smoke marijuana” and insisting that it has no medical value. He is even facing off with a 12-year-old girl in court over the legitimacy of the plant as a medicine. We are not criminals, junkies or idiots. We’re good, responsible, patriotic Americans. We’re voters from both parties and no parties. We are regular Jeffs all over the USA. We are upstanding citizens who don’t want to hide every time we want to enjoy a sesh. And frankly, we’re offended the top law enforcement officer in the nation thinks we’re bad people. #JeffSesh is the coming out party for 21st-century legal cannabis users. We bet Mister Sessions will be surprised to see what good people we are! He might even be surprised to learn that MOST states now allow citizens to legally and safely access cannabis for their own personal consumption. And that 64% of Americans approve legalization, according to Gallup. It’s been nearly 50 years since Federal cannabis law was updated, despite plenty of reason to do so. The rolling papers sell for $5 a pack and are available on Etsy as well as the website. As the group pointed out in their statement, an overwhelming number of Americans now support the legalization of Cannabis, and the Trump administration is pushing back against a policy that even most Democrats and Republicans agree on at this point. Not long after the Trump administration came to power, Sessions issued a memo making orders for law enforcement to reverse their growing policy of leniency towards cannabis users. “Previous nationwide guidance specific to marijuana enforcement is unnecessary and is rescinded, effective immediately,” the memo stated. Despite the resistance that legalization has seen under the recent administration, the number of states that are legalizing the plant for both medical and recreational use continue to grow. A recent study, published in the journal, ‘Scientific Reports,’ suggests that smoking cannabis is roughly 114 times safer than drinking alcohol. Ironically, out of all the drugs that were researched in the study, alcohol was actually the most dangerous, and it was the only legal drug on the list.Just behind alcohol, heroin and cocaine were listed as the next most dangerous, followed by tobacco, ecstasy, and meth. The criteria that these drugs were arranged by, was according to the likelihood of a person dying from consuming a lethal dose.“The results confirm that the risk of cannabis may have been overestimated in the past. At least for the endpoint of mortality, the [margin of exposure] for THC/cannabis in both individual and population-based assessments would be above safety thresholds (e.g. 100 for data based on animal experiments). In contrast, the risk of alcohol may have been commonly underestimated,” the report states. “Currently, the MOE results point to risk management prioritization towards alcohol and tobacco rather than illicit drugs. The high MOE values of cannabis, which are in a low-risk range, suggest a strict legal regulatory approach rather than the current prohibition approach,” the report continues. While this is not the first study to rank marijuana very low in terms of danger, it comes at a time when the debate surrounding marijuana legalization is more heated than ever before, with more and more people agreeing that it is time to end prohibition. In reality, a prohibition of any kind is a scam, and the drug war is a racket of many prohibitions. What the drug war actually accomplishes is the establishment of black markets and gangs, the erosion of personal liberties, the expansion of the prison system and prison population as well as a constant excuse for frivolous government spending. This hypothesis has been tested time and time again, anytime throughout history where a ruling power has prohibited the consumption or possession of any item whatsoever. This process was made quite clear during the alcohol prohibition of the 1920s and 1930s. As we saw with alcohol prohibition, making a substance illegal does nothing to stifle its use, but simply creates outlaws out of nonviolent people and foments a culture of violence that the rest of society is forced to deal with, even if they have no interest at all in the banned substance. Prohibitions of any kind should be opposed, for the reasons I have laid out in the past. However, marijuana is of a specific immediate importance though, because of its ability to heal sick people and create more environmentally friendly industrial products. It is also one of the safest drugs known to our species.